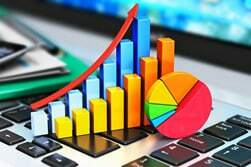 Indicators, such as moving averages and Bollinger bands, are mathematically based technical analysis tools that traders and investors use to analyze the past and predict future price trends and patterns. Where fundamentalists may track economic reports and annual reports, technical traders rely on indicators to help interpret the market. The goal in using indicators is to identify trading opportunities. For example, a moving average crossover often predicts a trend change. In this instance, applying the moving average indicator to a price chart allows traders to identify areas where the trend may change. Figure 1 shows an example of a price chart with a 20-period moving average. Strategies, on the other hand, frequently employ indicators in an objective manner to determine entry, exit, and/or trade management rules. A strategy is a definitive set of rules that specifies the exact conditions under which trades will be established, managed, and closed. Strategies typically include the detailed use of indicators, or more frequently, multiple indicators, to establish instances where trading activity will occur. 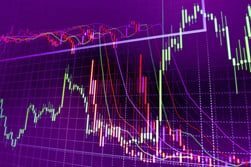 While this article does not focus on any specific trading strategies, it serves as an explanation of how indicators and strategies are different, and how they work together to help technical analysts pinpoint high-probability trading set-ups. 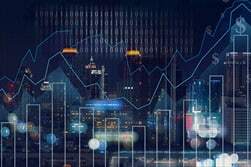 A growing number of technical indicators are available for traders to study, including those in the public domain, such as a moving average or stochastic oscillator, as well as commercially available proprietary indicators. In addition, many traders develop their own unique indicators, sometimes with the assistance of a qualified programmer. Most indicators have user-defined variables that allow traders to adapt key inputs such as the "look-back period" (how much historical data will be used to form the calculations) to suit their needs. A moving average, for example, is simply an average of a security's price over a particular period. The time period is specified in the type of moving average; for instance, a 50-day moving average. This moving average will average the prior 50 days of price activity, usually using the security's closing price in its calculation (though other price points, such as the open, high, or low can be used). The user defines the length of the moving average as well as the price point that will be used in the calculation. A strategy is a set of objectives, or absolute rules defining when a trader will take action. Typically, strategies include both trade filters and triggers, both of which are often based on indicators. Trade filters identify the set-up conditions; trade triggers identify exactly when a particular action should be taken. A trade filter, for example, might be a price that has closed above its 200-day moving average. This sets the stage for the trade trigger, which is the actual condition that prompts the trader to act, AKA the line in the sand. A trade trigger might be when price reaches one tick above the bar that breached the 200-day moving average. Figure 2 shows a strategy utilizing a 20-period moving average with confirmation from the RSI. Trade entries and exits are illustrated with small black arrows. Figure 2: This chart of QQQQ shows trades generated by a strategy based on a 20-period moving average. A buy signal occurs at the open of the next bar after price has closed above the moving average. The strategy uses a profit target for the exit. Should the trade be entered as soon as price moves a specified distance above the moving average, at the close of the bar, or at the open of the next bar? An indicator is not a trading strategy. An indicator can help traders identify market conditions; a strategy is a trader's rulebook: How the indicators are interpreted and applied in order to make educated guesses about future market activity. 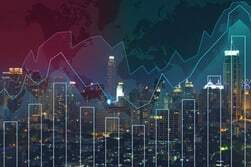 There are many different categories of technical trading tools, including trend, volume, volatility, and momentum indicators. Often, traders will use multiple indicators to form a strategy, though different types of indicators are recommended when using more than one. Using three different indicators of the same type—momentum, for example—results in the multiple counting of the same information, a statistical term referred to as multicollinearity. Multicollinearity should be avoided since it produces redundant results and can make other variables appear less important. Instead, traders should select indicators from different categories, such as one momentum indicator and one trend indicator. Frequently, one of the indicators is used for confirmation; that is, to confirm that another indicator is producing an accurate signal. A moving average strategy, for example, might employ the use of a momentum indicator for confirmation that the trading signal is valid. One momentum indicator is the Relative Strength Index (RSI), which compares the average price change of advancing periods with the average price change of declining periods. Like other technical indicators, the RSI has user-defined variable inputs, including determining what levels will represent overbought and oversold conditions. The RSI, therefore, can be used to confirm any signals that the moving average produces. Opposing signals might indicate that the signal is less reliable and that the trade should be avoided. Each indicator and indicator combination requires research to determine the most suitable application with respect to the trader's style and risk tolerance. One advantage to quantifying trading rules into a strategy is that it allows traders to apply the strategy to historical data to evaluate how the strategy would have performed in the past, a process known as backtesting. Of course, this does not guarantee future results, but it can certainly help in the development of a profitable trading strategy. What type of indicator a trader uses to develop a strategy depends on what type of strategy he or she intends on building. This relates to trading style and risk tolerance. A trader who seeks long-term moves with large profits might focus on a trend-following strategy, and, therefore, utilize a trend-following indicator such as a moving average. A trader interested in small moves with frequent small gains might be more interested in a strategy based on volatility. Again, different types of indicators may be used for confirmation. Figure 2 shows the four basic categories of technical indicators with examples of each. Traders do have the option to purchase "black box" trading systems, which are commercially available proprietary strategies. An advantage to purchasing these black box systems is that all of the research and backtesting has theoretically been done for the trader; the disadvantage is that the user is "flying blind" since the methodology is not usually disclosed, and often the user is unable to make any customizations to reflect his or her trading style. Traders often talk about the Holy Grail—the one trading secret that will lead to instant profitability. Unfortunately, there is no perfect strategy that will guarantee success for each investor. Each trader has a unique style, temperament, risk tolerance, and personality. As such, it is up to each trader to learn about the variety of technical analysis tools that are available, research how they perform according to their individual needs, and develop strategies based on the results.